Like gems that shimmer in the sun, each of the islands of the Balearics shine with their own unique quality. 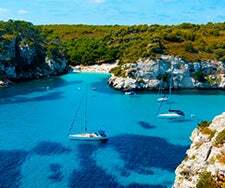 The islands - Menorca, Majorca, Ibiza and Formentera - offer visitors going on holidays an array of activities and sights to enjoy. Their beaches are also nearly perfect: Turquoise waters, white sands and sunshine holidays! Find out what each island has to offer and see which beach is the perfect summer destination for you! 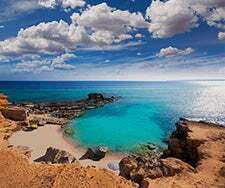 Known as the "Queen of the Calas", Cala Galdana is a sight to behold. Its perfect crescent shape is lovely and its wide beach is one of the largest of the islands, boasting calm and shallow waters that make it a great destination for families. The area is also well equipped with parking to easily carry around all of the family's beach toys and floats. The southern coast of Majorca is home to Es Trenc, a fairly isolated beach preserved in its natural beauty. Often compared to the exotic Caribbean beaches, Es Trenc boasts 2km of white sands and crystal clear waters, as well as sand dunes and wetlands. A perfect escape for the true lovers of nature. 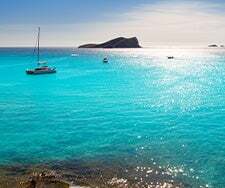 The Ibiza beaches, playa d'en Bossa in particular, is a great location for those who want Ibiza holidays filled with an exciting night life and shopping in a resort hotel atmosphere. This area boasts one of the most popular resorts on the island and the hottest party venues. Those looking for a complete day at the beach filled with activities and water sports are in for a treat in Formentera. Located on the northern tip of Formentera is eDreams’ top recommended destination for its kite-surfing, sailing, water-skiing and windsurfing excursions. It is a definite must for the water sport enthusiasts amongst you. 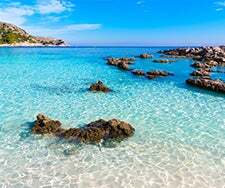 Cala Macarella is a gorgeous beach located in the south of Menorca in the Balearic Islands. With turquoise waters in gorgeous shades of blue, it may be the closest thing to paradise to set your sights on. This destination is an ideal spot to swim in and enjoy a sun-filled holiday.